The original name for Kelsey’s includes the suffix “Original Roadhouse”. 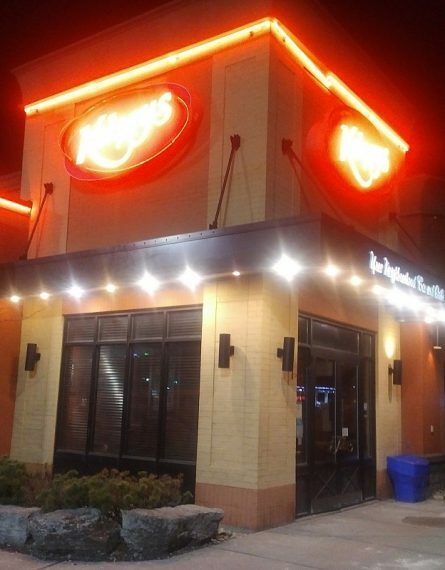 It was a frosty January night when we visited Kelsey’s on Kingston Road in Ajax. I can’t recall when or if I ever went to one. It was not busy, but they were dealing with a bus load (literally) of people. We were seated in a booth in the bar area, which was quiet. The service was slightly slow because keeping on top of such a large group was challenging. But our server was friendly and surprisingly honest. My brother ordered a dish that she could not recommend. It had been sent back too many times she said. This was the Gooey Bacon Mac and Cheese. One thing that has improved life in Canada is the embracing of micro or small brewery’s beers. I had a Creeemore lager and it was good. It’s one of the grandfathers of non Molson style beers, but a pleasure to have. For my dinner I had the Salt and Vinny Fish & Chips, which had a great batter and was tasty. This particular Kelsey’s I think needs some maintenance because the edges are a big “tired,” as they say in the hospitality industry. However, this would not stop me going again.